These Americans got raises thanks to Obama's overtime rules, and then saw them taken away. What it’s like to get a raise thanks to the Obama administration’s overtime rules for American workplaces—and then have it taken away. 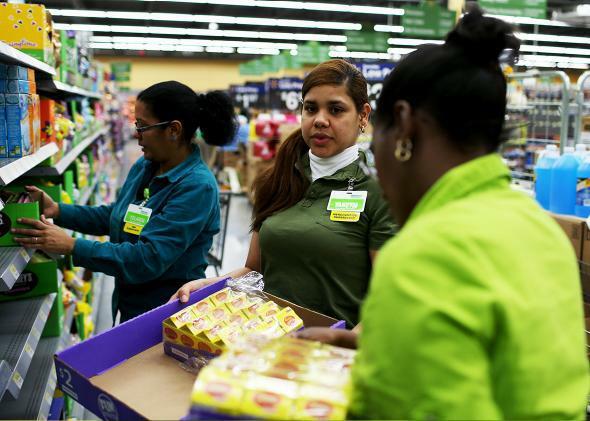 Walmart is one of the companies that announced raises for some workers to comply with the new regulation—and then kept them after a court put the rule on hold. When Kristin Hook, a postdoctoral fellow at the University of Maryland, found out in early November that she would receive a raise of almost $4,000 the next month, she immediately increased her contributions to her retirement savings account. A week or two earlier, at Arizona State University’s Downtown Phoenix campus, social media coordinator Gordon Chaffin, who regularly puts in 45- to 50-hour weeks, learned from his employer that he would be eligible for overtime pay beginning Dec. 1. Neither Hook’s raise or Chaffin’s overtime eligibility happened. Instead, they became two of the estimated 4.2 million workers left in personal-finance limbo when a federal district judge in Texas issued a last-minute stay to the Obama administration’s initiative to overhaul the rules for overtime pay, which had led many employers to announce forthcoming changes to their workers’ compensation. After the ruling, Hook’s and Chaffin’s workplaces announced they would hold off on any changes initiated to bring them into compliance with the now-stalled regulation—a regulation that the Trump administration may be reluctant to defend. These workers were promised they would receive raises or overtime pay. And then, a presidential upset and a judicial ruling later, that promised money was taken away. “The university should not renege on something they said they were going to do,” Hook told me. Employees at the University of Maryland and Arizona State University are hardly alone. According to a survey conducted by the Korn Ferry Hay Group in the immediate aftermath of the ruling, just 56 percent of retailers said they would still go ahead with plans to comply with the overtime rules. The rest said they would either wait to see how the situation developed or handle the matter on an employee-by-employee basis, depending on their positions. In other words: The Obama administration effectively gave millions of Americans a raise, and now a huge chunk of them probably won’t get it. This presidential transition period has given us no shortage of reasons to feel outrage, but surely this particular one deserves a bit more of it, right? Some background: Under the Obama Labor Department’s initiative, the threshold under which salaried workers were supposed receive time-and-a-half pay for working more than 40 hours a week was to double from $23,660 to $47,476. Companies with workers who would be newly eligible for overtime pay under the regulation planned to comply in one of two ways: by either classifying those salaried employees as hourly ones and paying them overtime after 40 hours, or by giving them raises above $47,476 and continuing to allow them to work more than 40 hours without overtime. All of this, the Obama administration expected, was supposed to add an expected $12 billion to workers’ wallets over the next decade. Eddie Rodriguez, the chief executive officer of the JAE Restaurant Group, which owns more than 175 Wendy’s franchises, is also holding off. In a phone interview, Rodriguez estimated that complying with the ramped-up overtime-pay requirements would have cost his company more than $900,000 a year. By delaying implementation to the last possible moment, only to see the rule stayed, “we benefited,” he told me. When I asked Rodriguez how that decision impacted workplace morale, he said, “it wasn’t a topic of talk when you walked into the restaurants.” He thinks it’s possible that many workers who would have seen a pay boost thanks to the overtime rule change still aren’t aware of it. As he pointed out, “Most of our employees don’t know in the state of Florida the minimum wage is going up every year. They find out when they get a few more cents in their paycheck,” he said. That’s right. As Rodriguez pointed out, many workers simply missed the news that the Obama administration had effectively given them raises. Terese Kerrigan, the senior marketing manager at FreightCenter, a shipping logistics company based in Palm Harbor, Florida, told me that “less than 50 percent” of the firm’s employees knew of the pay boost until the company told them about it. (FreightCenter is keeping the raises.) Even some business owners didn’t get the word. In a survey by Manta, an online community for small business owners, 42 percent of respondents hadn’t heard of the regulation—and this was in December, after the law was originally scheduled to take effect. If you’re wondering why there hasn’t been more of an uproar about the magical disappearing raises, a marketing shortfall is as good an explanation as any. And even those who were aware of the change likely didn’t understand the impact. That was true of Chaffin, who knew he’d lost out on some money but didn’t realize he was due for $7,000 in overtime pay annually until he worked out his numbers at my prodding. Tks 2 @helaineolen, just realized how much $ I lost when new overtime rules halted. A huge amount that could've paid for blood tests I need. And there’s the bad political timing of the policy. We don’t know why the Obama administration couldn’t get the extra money into Americans’ pockets before the election. The court’s action, which took place after the presidential vote, potentially denied Democrats a popular issue. After all, people like getting raises and are never happy to see them taken away. A poll conducted in late summer 2016 by the National Employment Law Project Action Fund found 81 percent of voters in Wisconsin and Pennsylvania and 80 percent of those in Ohio either strongly or somewhat favored the revamped overtime rules once told about them. Our best chance of seeing how the Trump administration wants to proceed is at Puzder’s Senate confirmation hearing, which has been postponed twice already. When it finally takes place, perhaps someone can ask him about the overtime regulations. Millions of Americans would like to know what he thinks.